This DIY is all about reusing jars and bottles. One cup sake containers from the 100 yen store, like the ones on the far left and right, make great vases and storage containers for condiments. Now just put some kanji on there and you've got something special! 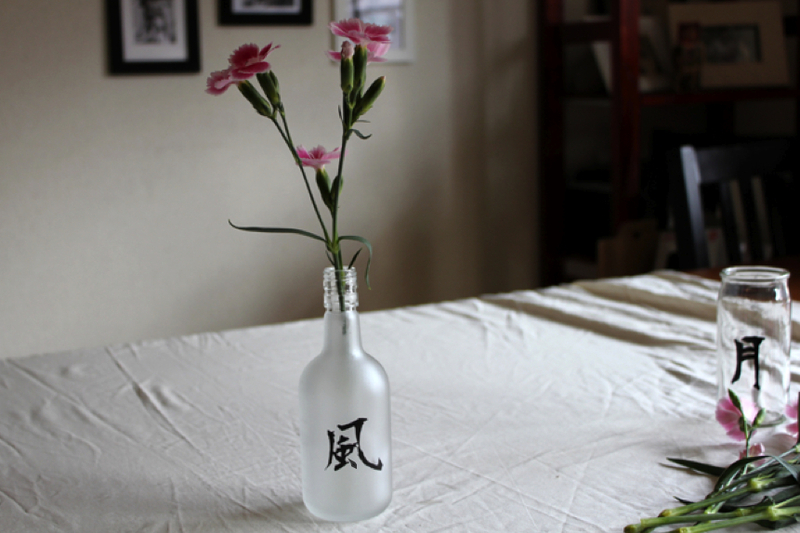 The kanji on these cups is an old Japanese proverb that roughly translates to "The beautiful elements of nature." It makes more sense when you look at the meaning of each kanji. From left to right: ka (flower), cho (bird), fu (wind), getsu (moon). 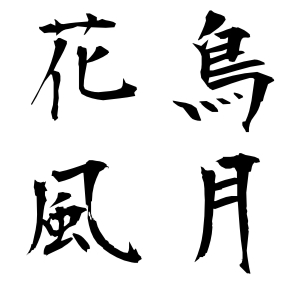 So together it reads: Kachofugetsu. Impress your friends with that one this weekend! 1. Gather 4 used cups and/or bottles. Remove labels. Clean and dry. 2. 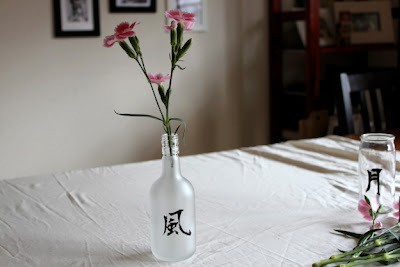 Download the kanji pictured at the bottom of this post and size it to fit your vases. Print out (I like to print out on the back of used paper). 3. 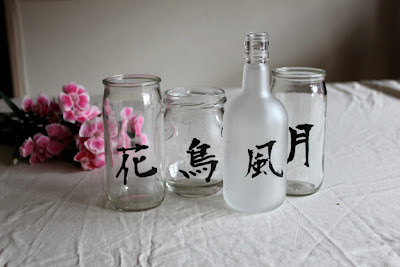 To paint onto jars, all you need to do is tape each individual kanji to the inside of the cup and trace on the outside of the jar with your marker. 2 coats of paint look best. 4. For bottles, place clear contact paper over the printed kanji. 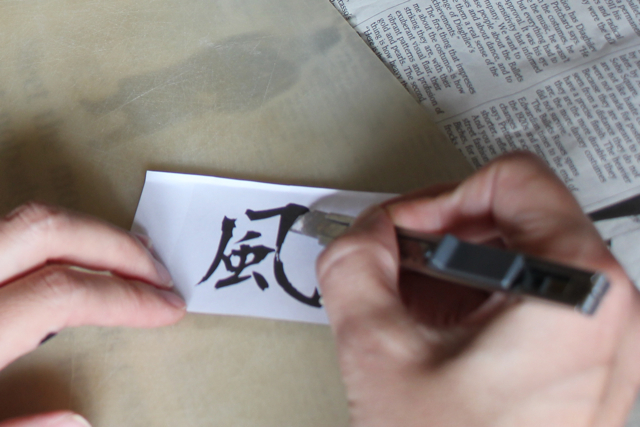 Use an X-Acto knife to cut along the edges of the kanji to make a stencil. Watch out for the cutouts inside the kanji like the one below. 5. 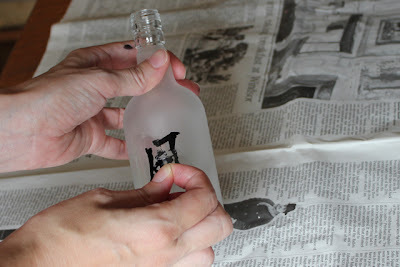 Stick the contact paper to the face of the bottle. 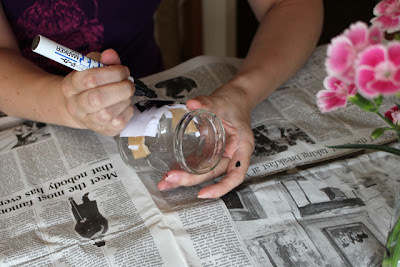 Use your finger to make sure it all sticks to the glass. 6. 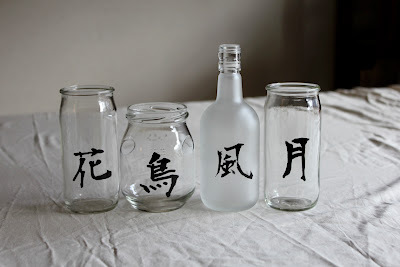 Use your paint pen to paint on kanji like a stencil. 7. When dry, peel off the contact paper. I hope you have fun with this one. Have a great Thursday! Photos by Vanessa for Design Dreams Japan. cute idea! i may try this one day soon, alot of kanji are posted on websites, so i might make a collection. arigatou!